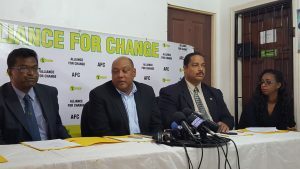 The Alliance For Change (AFC) on Tuesday announced that one of its representatives could soon be appointed an elections commissioner, following the death earlier this week of A Partnership for National Unity’s (APNU) representative on that body. “Upon his request, the party has submitted a name to His Excellency President David Granger for consideration in naming a replacement for Ms. Jones as GECOM (Guyana Elections Commission) commissioner,” the party announced in a message of condolence on the passing of Sandra Jones. Well-placed sources told Demerara Waves Online News that the representative, who is not a newcomer to politics, is set to be a highly qualified youthful person who possesses very good analytical skills if Granger agrees to the nominee. The party sources have also indicated that sections of the AFC leadership see the party’s occupancy of a seat on the seven-member GECOM as a positive move in light of the now simmering brouhaha over whether it had played a role in President Granger’s unilateral appointment of Retired Justice James Patterson as GECOM. The AFC has repeatedly denied being involved in that decision, but has acknowledging advising President Granger about his constitutional right to unilaterally appoint someone. In distancing itself from that appointment, the AFC has pledged to keep a watchful eye out for any electoral irregularities. The AFC says it extends its deepest condolences to the family, relatives and colleagues of Ms. Sandra Jones AA, who passed away recently after a period of illness. “The party recognizes Ms. Jones’ contribution to the Guyana Elections Commission since 2012 when she was sworn in as commissioner replacing Mr. Robert Williams. Ms. Jones also gave yeoman service in the field of management consultancy and human resources and is widely regarded as a patriot,” the party said of the lady who was awarded an Arrow of Achievement (AA). Since the appointment of the GECOM Chairman after almost one year, the body has not met to discuss, among other things, whether there would be fresh house-to-house registration or resumption of continuous registration after almost one year, and preparations for next year’s Local Government Elections.